Virginia farms offer pick-your-own opportunities allowing costumers to enjoy fresh local produce including apples, pumpkins, berries, peaches, vegetables and more. A trip to get healthy foods directly from an orchard or roadside market makes for a great family outing. Here is a guide to the orchards in Northern Virginia. Many of these farms host special events with hayrides and seasonal activities for children. Be sure to call ahead to make sure that the item you wish to pick is available. Crooked Run Orchard - 37883 E. Main Street, Purcellville, VA (540) 338-6642. Open April-December. Pick-Your-Own: Sour Cherries, Blackberries, Peaches, Plums, Apples, Pears and some vegetables and many varieties of culinary and medicinal herbs, basil, oregano, thyme, lemon balm. Availability will vary week to week. Great Country Farms - 8780 Foggy Bottom Road. Bluemont, VA (540) 554-2073. Open April-November. Pick-Your-Own: Asparagus, Strawberries, Black Raspberries, Blueberries, Plums, Peaches, Blackberries, Tomatoes, Okra, Green Beans, and Pumpkins. 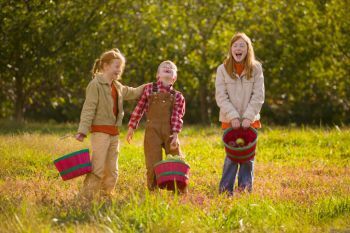 Great Country Farms is a 400 acre working farm with family friendly attractions and seasonal festivals including an Easter Egg Hunt, Strawberry Jubilee Festival, Peach Daze Fuzztival, Apple Gall, Fall Pumpkin Harvest and many more. Hartland Farm - 3205 Hartland Lane, Markham, VA (540) 532-0436. Open mid-June-end of December.Pick-Your-Own: Cherries, Peaches, Blueberries, Apples, Sweet Corn and Tomatoes. Green Truck Farm is also located in the front fields of Hartland Orchard and offers pick your own strawberries. Hollin Farms - 1408 Snowden Road, Delaplane, VA (540) 592-3574. Open May-October. Pick-Your-Own: Strawberries, Lettuce, Radishes, Snow Peas, Sour Cherries, Raspberries, Blackberries, Peaches, Japanese Plums, Asian Pears, Cucumbers, Tomatoes, Sweet Corn, Peppers, Beans, Apples and More. Pick-Your-Own: Apples, Plums, and Peaches. There is also a farm market and a bakery onsite. Stribling Orchard - 11587 Poverty Hollow Lane, Markham, VA (540) 364-3040. Pick-Your-Own: Cherries, Blueberries, Peaches, Apples, Pears and Blackberries. Also available in limited supply are seasonal garden vegetables and free-range eggs. Green Truck Farm - 3015 Hartland La, Markham, VA. (540) 316-7715. Pick-Your-Own: Strawberries, Blueberries, Black Raspberries, Blackberries, Tomatoes, Red Raspberries, Pumpkins and Winter Squash. May-October. Wegmeyer Farm - 38299 Hughesville Road, Hamilton, VA (540) 751-1782. Pick-Your-Own: Strawberries and Pumpkins. The farm offers a Community Supported Agriculture (CSA) program from May to November. Members enjoy a wide range of fruits and vegetables.